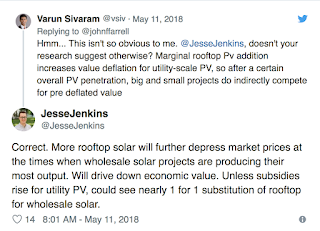 True Economics: 17/11/2018: California Rooftop Solar Mandate: An example of bad groupthink? 17/11/2018: California Rooftop Solar Mandate: An example of bad groupthink? In recent news, California legislators have done a gimmick-trick that has earned the state loud applause from the environmentally-minded consumers and activists: California Energy Commission (CEC) recently voted 5-0 to add a new provision to the state’s building code. This includes a requirement that from 2020, all new house and multi-family residences construction of three stories or fewer, along with all major renovations, must be built with rooftop solar panels. Given that the state currently builds ca 113,000 housing units a year, and rising, this should increase significantly already existent solar generation capacity from 15% of the housing stock, currently. Solar being mandated on virtually all new houses? Sounds like a renewables nirvana, especially given the fact that the state has huge solar generation potential due to its climate. But, as commonly is the case, there is a catch. Or two... or many more... And this means that California's latest policy mandate may be a poor example to follow, and potentially, a bad policy mistake. Here are the key reasons. Rooftop solar is about as effective in reducing emissions as waving a broom into the smog. UC Berkeley’s Severin Borenstein argued this in his note to CEC Commissioner (http://faculty.haas.berkeley.edu/borenste/cecweisenmiller180509.pdf). Note: Borenstein also alleges that CEC has failed to involve experts in energy economics in its decision making process - something that is not a good policy formation practice. UC Davis economics professor James Bushnell accused CEC of “regulatory groupthink.” (https://energyathaas.wordpress.com/2018/10/22/how-should-we-use-our-roofs/) and offered an alternative to roof solar that can generate far greater environmental benefits. There are, of course, other, more efficient ways for deriding emissions, including: mandating more urban density, raising home and cars efficiency standards, expanding the renewable energy mandate, improving grid efficiencies and transmission expansion, and so on. Once again, CEC did not allow for any independent assessment of the proposed plans economic and environmental impacts. There is an opportunity cost involved in roof solar: California has a state-wide mandate to achieve 50% renewables generation by 2030. Putting more if this target onto roof solar is simply moving generation capacity from one source to the other. Because too top solar is roughly 4-6 times more expensive than industrially-produced renewables, the substitution involves a dramatic reduction in economics of scale. This will raise the overall cost to California of reaching its 2030 target. Another opportunity cost, this time much more tangible and immediate than 2030 targets is the problem of California grid ability to swallow all the solar generation being put into place. California has to routinely dump excess solar energy supplies during peak generation times, because it is failing to find buyers outside the state. Worse, given the scale of each roof top generation unit, solar electricity from the roof tops cannot be controlled by the grid companies, because smart inverters needed to do this are too expensive for small scale generators. There is an argument, however, that economics of scale will kick in from a different side: mandating such a huge increase in atomistic (house-level) installations can result in more innovation and lower costs of new technologies going forward. This means that while costs might be high up front, they can potentially be deflated faster over time than absent the mandate. The same argument might hold for improvements in storage. Last, but not least, California roof top solar requirements will add new cost, to the housing in a state that is already in the middle of an atrocious housing crisis. CEC own analysis, not tested by any peer review, implies that homeowners are likely to face additional costs of ca $8,000-12,000. Over the depreciation cycle for housing stock, this is likely to translate into $15,600-$23,400 in current dollars (inflation-adjusted, using 2% inflation rate) increase in the cost of housing per household, once property taxes on new build values are factored in. With average house price in California in excess of $420,000, this is equivalent to raising house prices 3.75-5.57 percent. Of course, CEC promises savings that, according the Commission analysis will be net of higher costs. 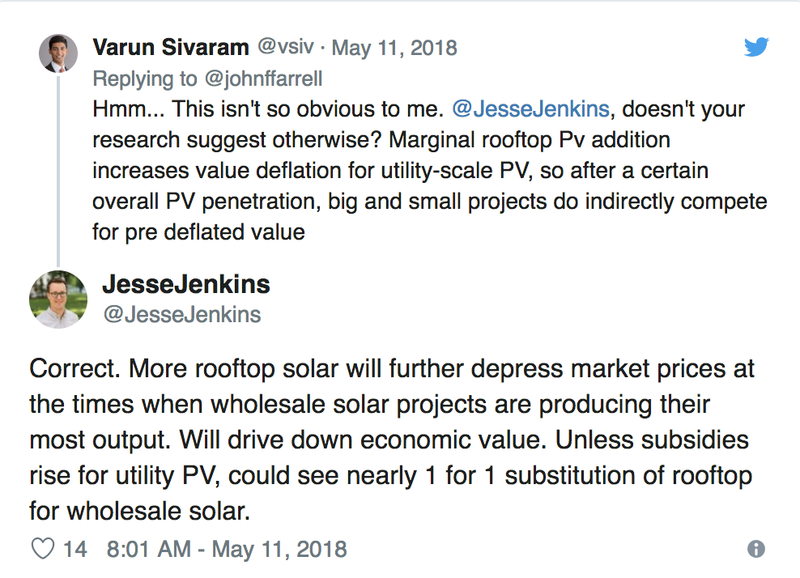 Problem is, no one actually tested these claims, and we simply do not know how the costs of switching all this roof top solar into the grid are going to be distributed across the households. Then there is macro level analysis of the solar energy benefits and costs. And California does not come out pretty in this. A new NBER paper, tiled "Heterogeneous Environmental and Grid Benefits from Rooftop Solar and the Costs of Inefficient Siting Decisions" by Steven E. Sexton, A. Justin Kirkpatrick, Robert Harris, Nicholas Z. Muller (NBER WP 25241, Nov. 2018: https://www.nber.org/papers/w25241.pdf) looked at "federal and state policies in the U.S." These policies "subsidize electricity generation from 1.4 million rooftop solar arrays because of pollution avoidance benefits and grid congestion relief. 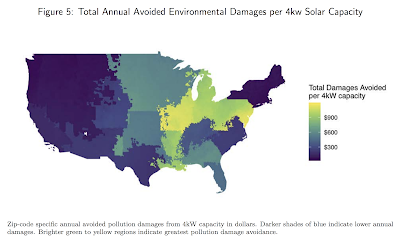 Yet because these benefits vary across the U.S. according to solar irradiance, technologies of electricity generators, and grid characteristics, the value of these benefits, and, consequently, the optimal subsidy, are largely unknown." What does this mean? Across the U.S., "policy, therefore, is unlikely to have induced efficient solar investments." The authors provide "the first systematic, theoretically consistent, and empirically valid estimates of pollution damages avoidable by solar capacity in each U.S. zip code". 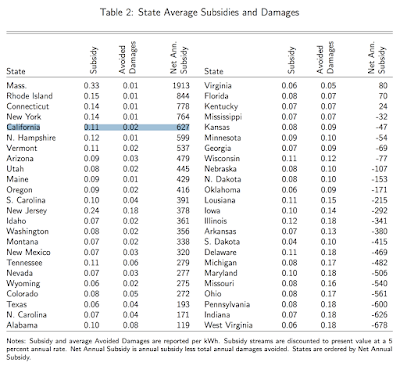 The also link "these external benefits to subsidy levels in each U.S. state, and [estimate] the share of these benefits that spillover to other states." Finally, the authors measure "the energy value of capacity across the U.S. and the value of transmission congestion relief in California." So what do they find? "Environmental benefits are shown to vary considerably across the U.S., and to largely spillover to neighboring states." Which is not a bad thing in itself, but it also means that some states pay for benefits accruing to other states. These transfers are not voluntary to the payers for solar - the households. 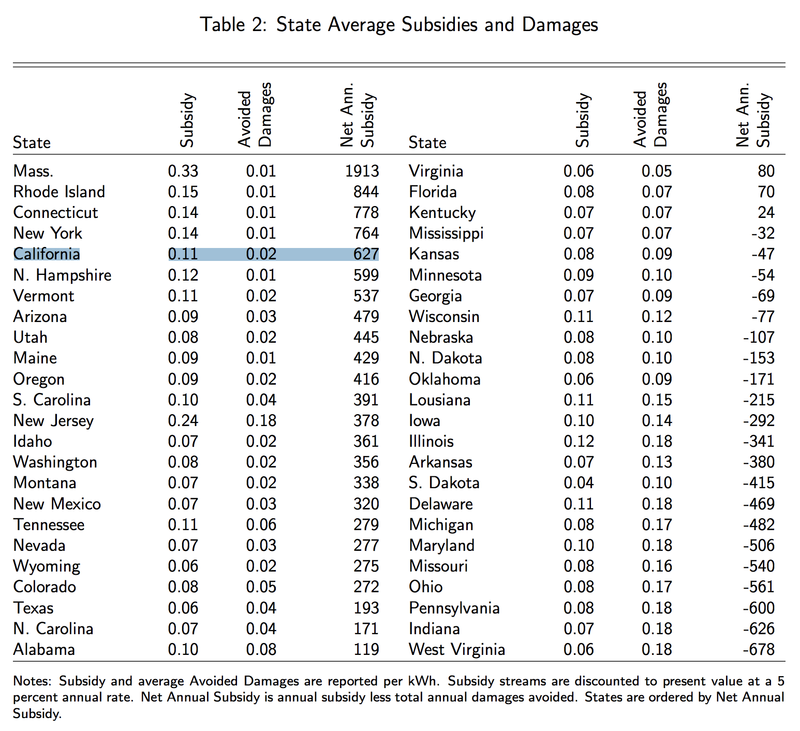 Furthermore, "subsidy levels are essentially uncorrelated with environmental benefits contributing to installed capacity that sacrifices approximately $1 billion per year in environmental benefits." Which, broadly-speaking means that subsidies for rooftop solar are not a great way to achieve environmental benefits. "...California rooftop solar is shown to generate no congestion relief." Or, as noted above, there are severe grid-related costs involved in rooftop solar in California, the state that decided to mandate it. Putting more detail on the NBER paper: "Total benefits of solar generation—inclusive of energy values — are estimated to be greatest in the Midwest and Mid-Atlantic. They are least in the West, and particularly the West Coast, where approximately two-thirds of systems are located." Why, given the fact that sunshine is more abundant in California than in the MidWest or Mid-Atlantic? "These differences are primarily attributable to heterogeneity in marginal responding fossil generation." Oh, wait, that is right: the more solar you put in, the more back up generation you need. And that is before you account for the solar installation possible effects of increasing demand for electricity as the second order effect. "In California, we find no evidence that rooftop solar capacity systematically relieves congestion. Approximately two-thirds of the 900,000 rooftop solar arrays is located upstream from transmission bottlenecks, contributing to congestion rather than relieving it. If capacity were efficiently allocated, congestion relief benefits in California would have been no more than $15 million in 2017—approximately 7% of total energy value." Cycle back to that California rooftop solar mandate. Does it really make any environmental sense? Because economics-wise, it does not appear to offer much more than a hype and a pump scheme.